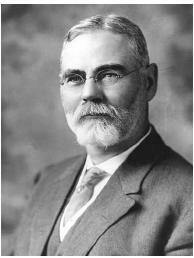 James Robert Mann served in the U.S. House of Representatives from 1897 to 1922. Mann, an Illinois Republican, sponsored three pieces of legislation that enlarged the power of the federal government to regulate the economy and the nation's morals. He is best remembered as the author of the Mann Act (18 U.S.C.A. § 2421 et seq. ), also known as the White Slave Traffic Act. Mann was born October 20, 1856, in McLean County, Illinois. He graduated from the University of Illinois in 1876 and then attended the Union College of Law (now known as the Northwestern University Law School). Following his admission to the Illinois bar in 1881, Mann joined a prominent Chicago law firm and achieved success as a business attorney. Mann became active in Chicago politics during the 1880s and was elected to the U.S. House of Representatives in 1897. As a moderate Republican, Mann believed that the federal government had a role to play in managing the national economy. His interest in reform was heightened by the work of muckraking journalists who produced sensational investigative articles exposing impure food processing and impure and often fraudulent drugs. In response to public concerns about the quality of food and medicine, Mann sponsored a major piece of federal legislation, the Pure Food and Drug Act of 1906 (34 Stat. 768). This act invoked the Constitution's Commerce Clause for authority to regulate the interstate shipment of food and medicine. The law signaled a change in the state-federal power relationship, which had previously emphasized the right of states to regulate business. The inspection of food products and medicines by the federal government both reassured the public about the quality of what it consumed and served notice that a national economy required national regulation. Mann demonstrated his continuing interest in regulation with his sponsorship of the Mann-Elkins Act of 1910 (36 Stat. 539). Mann-Elkins gave the Interstate Commerce Commission authority to regulate and set the rates for telegraph, telephone, and railroad companies. The law recognized that these modes of communication and transportation were a vital part of the interstate economy and that their rates needed to be regulated by the federal government rather than by the states. Mann was instrumental in the passage of the Mann Act in 1910. This act grew out of concerns of Chicago authorities that women and girls were being forced into prostitution through a variety of tricks and coercive tactics. The term white slavery came to symbolize the predicament of women who were kept in houses of prostitution against their will. It was alleged that "white slaves" (pimps and procurers) lured females from rural states into large cities such as Chicago and then forced them into prostitution. Responding to pleas from Chicago prosecutors that a federal Criminal Law was needed, Mann introduced the Mann Act. The act prohibited the transportation of women across state lines for prostitution or "any other immoral purpose." Mann skillfully guided the legislation through the House of Representatives, overcoming congressional Democrats who argued that the act expanded federal Police Power. Once passed, the Mann Act became a central part of the work of the newly created Federal Bureau of Investigation. "All of the horrors which have ever been urged, either truthfully or fancifully, against the black-slave trade pale into insignificance as compared to the horrors of the so-called 'white-slave traffic'." Mann died in Washington, D.C., on November 30, 1922. Grittner, Frederick K. 1990. White Slavery: Myth, Ideology, and American Law. New York: Garland. Margulies, Herbert F. 1996. Reconciliation and Revival: James R. Mann and the House Republicans in the Wilson Era. Westport, Conn.: Greenwood Press.